The woman’s attacker showed no mercy, even with a 3-year-old girl watching. A woman in Millburn, New Jersey, was brutally attacked in broad daylight during a home invasion Friday. It was about 10 a.m. and the mother was making breakfast when the intruder kicked in the back door. The entire event unfolded in front of her 3-year-old daughter and captured on a nanny cam which was placed on a shelf in the living room. The mother suffered a concussion and facial lacerations after being kicked or punched at least 16 times, as her young daughter sat on the couch, clutching a blanket and watching in horror as her mother was viscously beaten, kicked, choked and eventually thrown down the basement stairs by her attacker. The mother also had an 18-month-old son, who was upstairs asleep during the attack. Thankfully, the children were not hurt during the incident. The woman’s heart-wrenching screams can be heard on the video, but soon after the attack started, she made a decision which may have contributed to keeping her children safe. “I knew that if I started screaming, my daughter would too, and I was afraid she would get hurt. I took it. I didn’t cry the entire time,” the obviously terrified and traumatized young mother said. 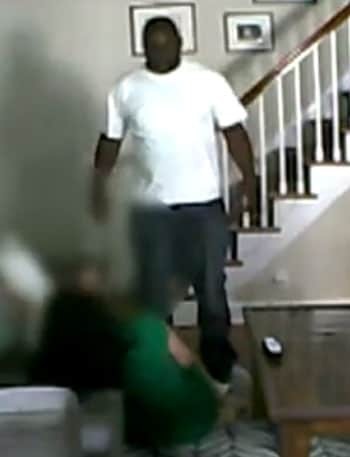 The woman, who wishes to remain anonymous, shared the video with reporters, in hopes that the footage will help to catch her attacker before he is able to do this to someone else. Although the intruder got away with several pieces of jewelry, including the woman’s wedding ring, she said that he never asked for anything. “There was no sort of conversation about, ‘Give him some things,’ which I would’ve done,” she said. Police also do not believe that the home was targeted and that this was a random act. “This can happen to anyone. And you know what? If he can break down my door, he’s going to break your door down,” the victim told reporters. The victim has since had a security system installed in her home. Investigators describe the suspect as a black man, about 5-feet-11-inches tall and weighing around 210 pounds. They also said he might have a light salt-and-pepper beard. The Essex County Sheriff’s Office is offering a $5,000 reward for any information that leads to the arrest of the attacker. Anyone with any information about the crime is asked to contact Lt. Keith Laverty of the Millburn Police Department at 973-564-7001 or 973-565-7016. As both a mother of three small children and a gun rights writer, my first initial instinct was to take this story and use it as an example of why it’s a good idea for mothers to be armed. But I didn’t think that was entirely fair. I didn’t want to point out what this woman had done wrong, because she didn’t do anything wrong. I didn’t want to re-victimize her simply because she does things differently than me. She was in the comfort of her own home, making breakfast while her baby slept upstairs and her toddler watched cartoons on the couch. Again, she did nothing wrong. Whether or not she had a gun in her home was neither the point of this article or the reason she so bravely chose to share the video. However, this video is the perfect example of where we have come in our society and why it is so important for each of us to take individual responsibility for our own protection. For me, this means owning a firearm, being proficient with it and making a conscious decision that I am willing to take the life of another human being if my own life or my children are threatened. For me, this means that I will carry in my own home because in the event that someone breaks down my front door, I have one of two choices. I could either leave my children in the living room with this person as I run to the bedroom, grab my gun and hope that this person does not harm my children in the process. Or I could stay where I am and direct my children to safety while I deal with the intruder by taking my gun from my hip and using it in the manner that I see fit in order to adequately protect me and my children. A gun tucked away in a closet somewhere is for all practical purposes useless if it’s ever needed. This is what self-protection means for me. That doesn’t mean it’s what it is for everyone, or that it should be. My reason for being a gun rights writer isn’t so that I may impose my views and opinions on everyone else and scold my readers when their ideas aren’t in line with mine. 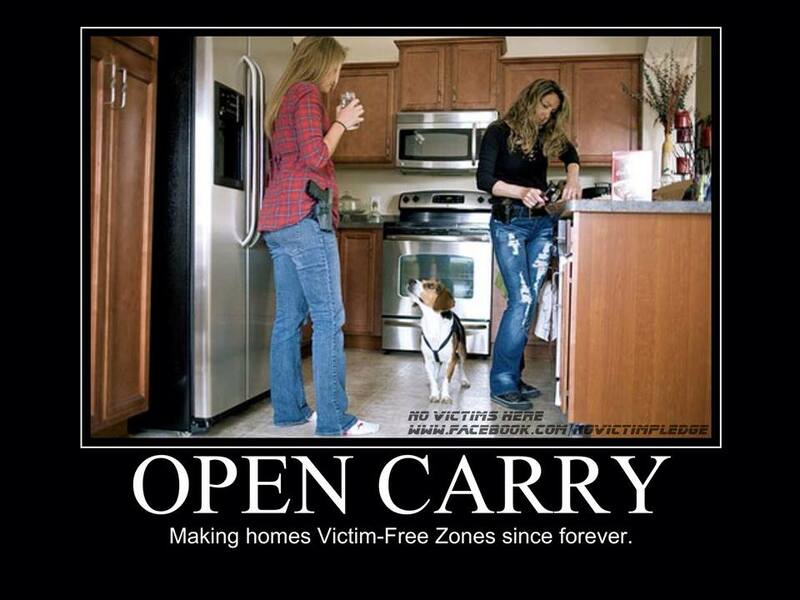 I believe that we should all have the right to choose whatever means of self-defense that we each see fit.